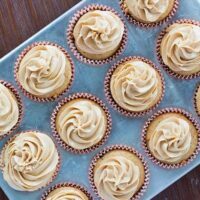 A while back, it occurred to me that I have never made Peanut Butter Cupcakes to share on TJCB before. None that are just peanut butter flavored, anyway. I’ve shown you guys tons of peanut butter and chocolate cupcake recipes, but never peanut butter cake topped with peanut butter frosting. Then I shared my Perfect Peanut Butter Buttercream recipe. You all LOVED it and RAVED about it! “Perfect” is NOT an understatement. Go check out that link and see what people had to say! I was blown away by the feedback and planned out this recipe to combine that frosting with a peanut butter cake. It’s a special little treat for those of us who are a bit peanut butter obsessed…like me. And I know it’s good because I sent these cupcakes to work with my husband and they were GONE before their lunch break was over. 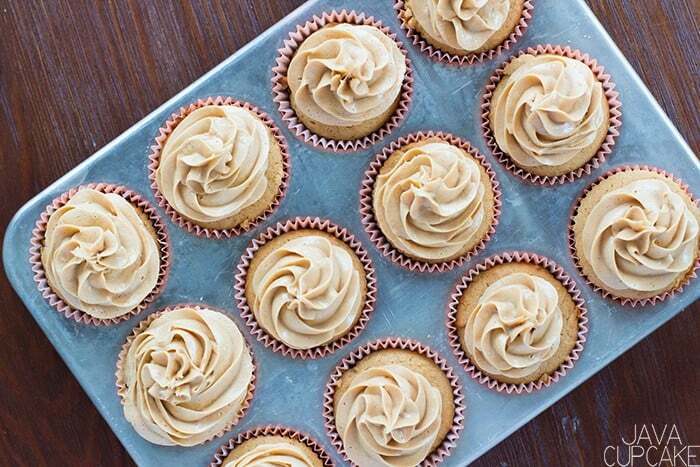 Here’s how to make these Peanut Butter Cupcakes. They’re SUPER simple! In the bowl of your stand mixer, combine the butter, peanut butter, sugar, and vanilla and mix for 2 minutes on medium-high speed. Stop 1-2 times to scrape the bowl. Add the eggs one at a time and, after each addition, mix until combined. Scrape the bowl again and mix on medium-high for 1 minute. Add half the flour mix on low until combined. Add the remaining flour mixture and fold in using a spatula. Scrape the bowl. Fill the cupcake liners evenly with batter. The batter will be thick. Bake for 23-25 minutes or until a toothpick pressed inside one of the cupcakes comes out clean. Don’t be tempted to take the cupcakes out early – they will be under-baked! Fill the piping bag fitted with the open star tip with my Perfect Peanut Butter Buttercream frosting. I can’t gush about these cupcakes enough, and I bet you’ll react the SAME way. First, the texture and taste of the cake? Ah-maz-ing. These are dense and moist peanut butter cupcakes (nothing’s gonna crumble on you here!) and full of that good PB flavor. The frosting swirled on top is just divine, too. Of course, it is my perfect recipe. And if I’m being completely honest here, I always let my kids take a big spoon full of frosting out of the container. Ok, who am I kidding…I took a big spoon full of frosting for myself too! 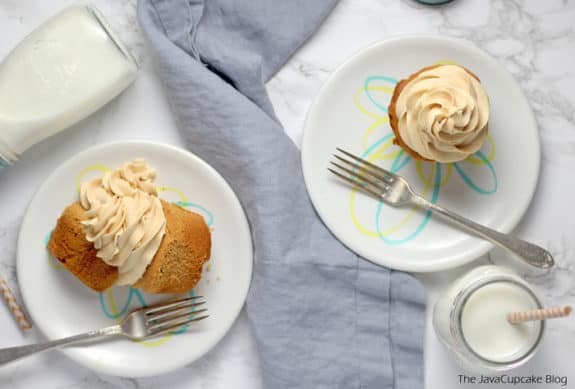 Also, this is THE easiest and quickest peanut butter cupcake recipe you’ll find. Period. Complex recipes are fuuuun to conquer…but it’s also a confidence-booster to put together something tasty in under an hour. 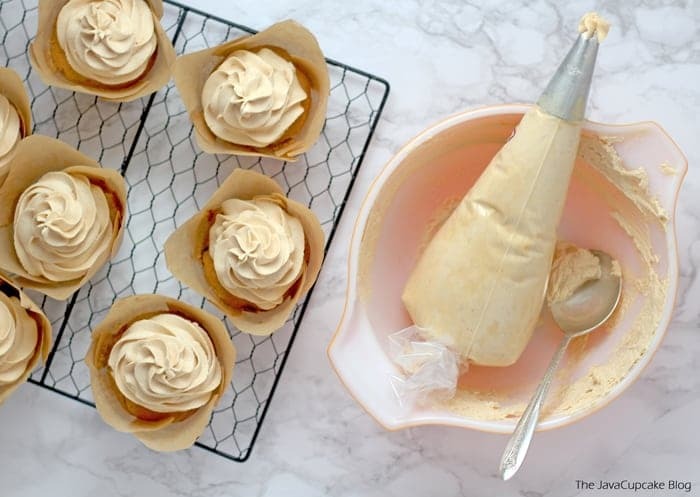 And if someone springs an event on you at the last minute, these are something you can whip up ASAP – including the frosting! Overall, I just know you’re gonna love these as much as I do. PS…I’d love to hear from you! Tell me how these cupcakes turned out for you, and how you plan on using them! I think they’d be great for just about anything…birthday parties, work parties, fundraisers, even weddings. So drop me a note in the comments below and, if you’re confused on something, be sure to ask me to clarify whatever you need. There are no stupid questions…I promise everyone can learn something from you! Preheat oven to 350F and line cupcake pan with liners. In a bowl, sift together the flour, baking power and salt and set aside. Add the eggs one at a time and mix until combined after each. Scrape the bowl again and mix on medium-high for 1 minute. Add half the flour and mix on low until just combined. Add the remaining flour and fold in using a spatula. Scrape the bowl. Bake for 23-25 minutes or until a toothpick comes out clean. Don't be tempted to take them out early - they will be under-baked! oooh that frosting actually does look legit! And I love the pb on pb combo! Calls for one tss baking powder. How much is that? Also, is this recipe available somewhere in cups instead of gms? Instruction #6 says to pour in the mix but I do not see any “mix” listed on the ingredients. Really want to try this but need clarification! Looks yummy! Hi Deb – Sorry about that tss typo! I fixed it. And the “mix” – I have no idea where that came from. haha #busymomlife Thanks for catching those for me! As for having the recipe in cups instead of grams… I do not have that. However, I highly recommend investing in a kitchen scale. You can get them online for $10-15 or at Walmart too. They’re digital now and very simple to use. Happy baking! 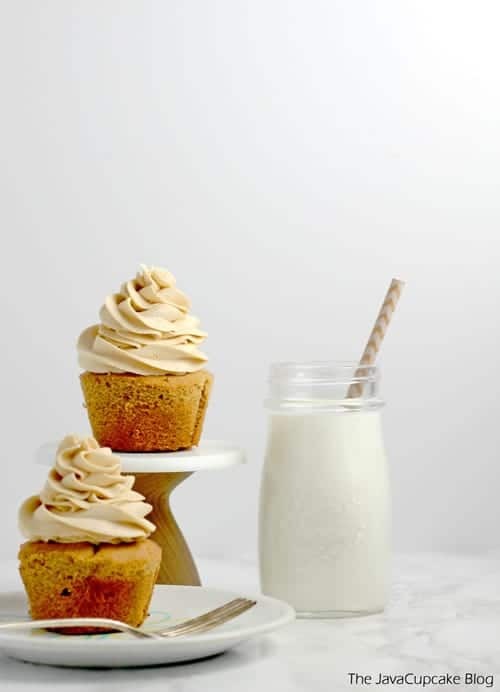 Is there anyway you could post your peanut butter frosting recipe? I can’t find this particular frosting at my store and these look delicious! First time I have ever baked anything by myself. Does the 60 ml of milk get mixed in with butter, peanut butter …? Where when do you add the milk??? Not sure where or when I needed to mix in the milk. So, I left it out…cakes are in the oven at the moment. Hope they turn out! I think together or after putting the eggs since they’re both “wet” ingredients. I’ll try it out.